In last month’s column, I spoke about the act of listening, and how music creators have been evolving compositional strategies that bring more awareness to the ways we listen. When we slow down and open our whole being to engage with the sounds our ears are receiving, we truly do enter into a realm of perception that transcends normal everyday life. This can, of course, happen when we are listening to traditional music, but when the creative and artistic intention is focused on creating shifts in our perception of sound, it is easy to feel as if we are slipping into an “alternative universe.” This is how Musical Toronto blog-writer John Terauds describes his experience of listening to Ann Southam’s music as performed by Eve Egoyan — a concert I wrote about in that same column in April. The Open Ears Festival of Music and Sound on May 31 and June 1 in Kitchener presents a perfect opportunity to stretch our listening awareness even further. This year’s festival, “Between the Ears,” offers a wide range of events including concerts, sound installations, a regatta of origami boats in a reflecting pool, performative sculptures, late night improvisations and a street market. On May 31, some wild things are in store for festival-goers, including the percussion music of Australian composer Erik Griswold. His pieces have been described as the place where music and kinetic sculpture merge. Imagine a percussionist playing an array of temple bells and bowls accompanied by the sounds and rhythms created by a cone-shaped pendulum spilling 50 pounds of rice through a large funnel. This is Griswold’s work Spill. In his piece Strings Attached for six percussionists, the gestures of the performers become a living sculpture. Their mallets are attached with nylon ropes to a lighting rig, thus visually magnifying their movements. Other features of the Friday evening event include a performance of James Tenney’s Having Never Written A Note for Percussion — a stunning acoustic experience sure to stretch you wide open. In fact, my body can still remember the reverberations I experienced back in 2000 when this piece was performed at the Tenney farewell concert in Toronto. A single note on an instrument of choice is played as a tremelo for “a long time.” It begins at the threshold of hearing and rises in volume to an extreme threshold before returning again to silence. A simple concept yet the complex sonic results are unforgettable. The festival evening will wind down with Hit Parade by Christof Migone. Participants lie face down and pound the pavement with a microphone. Everyone has their own amplifier positioned as far away as possible and can take breaks after each 100 hits. A sonic playground extraordinaire! June 1 brings a performance by current and founding members of the legendary improvising ensemble CCMC (who also were the founders of the Music Gallery), and a cutting edge electronic piece, La chambre des machines, created by Martin Messier and Nicolas Bernier who digitally transform sounds made from machine gears and cranks. The night ends at the Walper Hotel with the members of Freedman (Justin Haynes, Jean Martin and Ryan Driver) performing on a ukulele, a suitcase and a street-sweeper bristle. Xenakis and Beyond: Just preceding “Between the Ears” is another festive gathering called “Random Walks: Music of Xenakis and Beyond” running from May 24 (in Toronto) to May 25 (in Waterloo). Presented by the Fields Institute, the Perimeter Institute and the Institute for Quantum Computing in Waterloo, this two-day event will focus on the music, ideas and influence of Greek composer and architect Iannis Xenakis. Concert presentations of his string quartet, percussion and electroacoustic music will be intermingled with lecture and discussion sessions. Xenakis was a 20th-century “heavy weight,” whose ideas continue to have a profound impact across many disciplines. Part of the festival will be devoted to exploring and taking stock of the range of this influence on, among others, composers, mathematicians, architects and computer scientists. Xenakis’ music is often quite physically demanding on the performer, requiring a high level of technical prowess. That should bode well for some extraordinary concert experiences. Performers include the JACK Quartet, renowned for its “explosive virtuosity,” and an extensive list of percussion soloists and ensembles, including Montreal’s Aiyun Huang and Toronto’s TorQ Percussion Quartet. For a great essay on Xenakis’ string quartet music, I recommend the article written by James Harley, accessible through a weblink on the festival’s home page (google “Random Walks”). Noted speakers include musician and author Sharon Kanach who worked closely with Xenakis for many years, and composer/computer programmer Curtis Roads, former editor of the Computer Music Journal who also pioneered a form of computer sound creation known as granular synthesis. More on string quartets: May seems to be the month not only for experimental music festivals, but also for string quartets specializing in contemporary music. Besides the JACK Quartet mentioned above, the Mivos Quartet from New York will be offering two concerts with slightly varying programs on May 24 at Gallery 345 and May 25 at Heliconian Hall. The young players of this quartet came together in 2008 after graduating from the Manhattan School of Music and set out to expand the quartet repertoire by commissioning and collaborating with a wide cross-section of contemporary composers. 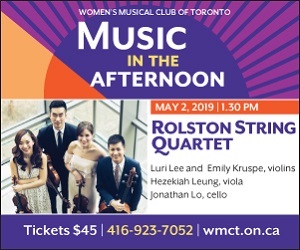 A third quartet — the Toronto-based Magenta String Quartet — will be presenting works by Toronto composers Eatock, Gfroerer and Vachon on May 25 at Eastminster United Church. East and West: The East and West musical dialogue continues in two extraordinary events this coming month. First up is a production by the Toronto Masque Theatre of The Lesson of Da Ji written by two of Toronto’s own: composer Alice Ping Yee Ho and librettist Marjorie Chan. Traditionally, masque is a fusion of music, dance and theatre which flourished in Europe during the 16th and 17th centuries. This new work, which runs from May 10to 12 at the Al Green Theatre, will be a contemporary take on the older form based on the true story of the Shang dynasty concubine Da Ji and the King who took revenge on her secret lover. The music will blend European baroque instruments with various eastern instruments including the pipa, erhu and guquin, which Da Ji learns to play as part of the narrative. A traditional Peking Opera dance performance will complement the blending. The second East and West event will be Soundstreams’ season finale concert, “Music for China,” on May 14, which also happens to be their first stop on the way to touring in China. Featuring music for chamber orchestra written by Chinese, North American and European composers, the concert will include performances by the Canadian Accordes String Quartet and the Chai Found Music Workshop — an ensemble from Taiwan that specializes in contemporary classical as well as traditional Chinese and Taiwanese music. I do have to note a heartening feature of this concert program, even though it is not mentioned in any of the media releases (which is not to be taken as a criticism, but rather a sign of progress). All works on the program are written by women, with the exception of the piece composed by Murray Schafer. This fascinating lineup includes composers Dorothy Chang (USA), Fuhong Shi (China), Alexina Louie (Canada) and Kaija Saariaho (Finland). Contemporary choral: Four concerts of contemporary choral music are in store for lovers of this genre. The Oriana Women’s Choir celebrates the 80th birthday of Ruth Watson Henderson on May 25 with a concert featuring several of her compositions along with premieres by emerging composers. On June 1 the Amadeus Choir joins with the Bach Children’s Chorus to present Henderson’s Voices of Earth and a premiere by Eleanor Daley. And on May 10, the Upper Canada Choristers sing music of the Americas, including pieces by Astor Piazzolla (Fuga y misterio) and Eric Whitacre (Lux Aurumque) sung by their highly accomplished Latin ensemble Cantemos. If you haven’t yet heard the virtual choir version of Lux Aurumque — it’s a must. Go to YouTube and search it out. Whitacre’s music is also included in the Da Capo Chamber Choir’s concerts on May 4 (Kitchener) and May 5 (Waterloo), along with works by Leonard Enns and Glenn Buhr. Emerging: New sounds by young composers can be experienced at two events, both happening on May 25. At the Music Gallery, the ∆TENT ensemble performs works by emerging local and international composers, while the group called “(insert TITLE)” showcases works for the marimba. Arraymusic presents their annual Young Composers’ Workshop Concert with premieres by four emerging composers who have spent the month workshopping and experimenting with members of the Array ensemble to create their new pieces. With such an eclectic mix of concerts representing widely diverging aesthetics to choose from, this month offers the perfect time to open your ears to something you may not have encountered before. And in so doing, you will be right in step with the stimulating forces spring offers.